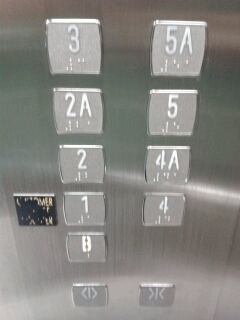 The floor numbering system starts at “1”. There is no ground floor. I’m beginning to wonder if Australia is in the minority for having a ground floor – wherever we travelled in Northern Europe and Russia, they always started at 1. Is it like driving on the left-hand side of the road – just a handful of countries do it? The UK uses the ground floor, 1st floor, 2nd floor system, but in North America ground floor is 1 also, so I think Judy is right, that system is less prevalent. In Dubai, some buildings start at 1 and some at ground floor (I guess it depends on the nationality of the developer) which is totally confusing! Well there you go! I guess we all assume everyone does it ‘our’ way, whichever that may be. This is how the US does it too- no ground floor, we start at one, not zero. Like normal rational people. Just kidding, kinda. I just discovered your blog and have really enjoyed reading your perspective on my home country. Living in Hong Kong, this ground floor business had me highly perplexed as well! Now the “2nd” floor is the 1st and so on… I don’t know if you have noticed this but in some developments in Singapore (and occasionally in HK), there is no 13th floor. Sometimes, there is no house number 13 (may be euphemistically named floor/ unit 12A or 12 B instead). The missing floor 13 is quite normal to me as most Australian buildings skip it (which means the 14th floor is really the 13th!). Thanks for stopping by my blog. I love living in your home country!